TELESIS® Technologies; the leader in robust, innovative, and dependable industrial permanent marking solutions for more than 40 years, offers a wide range of PINSTAMP® and LASER products to satisfy the unique identification requirements of the Defense markets. Whether you need to meet the deep engraving requirements of CFR 478 AND 479, add a UII barcode to meet the Department of Defense UID specification MIL STD 130N, or simply want to permanently brand your product with your logo and company ID, TELESIS® has the Solution! Our broad family of LASER markers provides the versatility to satisfy almost any of the many marking surface processing techniques required. 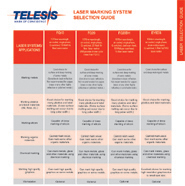 Our FQ, EV and CO families of LASERs offer proven marking solutions. Whether it’s permanent color change in your product such as annealing metal; deep engraving in excess of 0.012” in steel; anodized coating bleaching or removal; Telesis can help. Our PINSTAMP® markers are available in several models, with electric, or pneumatic operation and are designed for integrated, stand alone and hand held operation to more easily meet your marking requirements. Overseeing it all is our Merlin® design and control software, available for both LASER and PINSTAMP® product lines. This full function software allows the customer to design, integrate, and record messages and data easily, and reliably using a Window’s based PC. This software offers WYSIWIG (What You See Is What You Get) design capability with remote data import and export, log, and recording options (particularly helpful with UID and CFR recording requirements).. Automatic Serialization, date codes, time codes, graphics, logos, 1 and 2-D barcodes including QR and UID configurations allow you to meet your CFR and UID requirements with ease. All of our products come standard with Telesis’ renowned service and support, industry leading warranties, and the access to over 40 years of knowledge and experience in the marking industry with our custom Engineering and Applications Department. Not sure what you need? Don’t know which system would work best in your application? Our Process Lab is the largest in the US, and available to test your process, record the results and present a complete recommendation to you to insure the best result for your application. The FQ series : Telesis pioneered the use of ytterbium fiber lasers in the US over 10 years ago. These air-cooled fiber laser markers are available in 10, 20 and 30W versions, and have earned a reputation for dependability, ease of integration, and quality. The FQ series is a proven choice for metal marking applications, especially those where deep engraving in excess of 0.010” or annealed marking is required. Small and compact, they are an excellent choice for integration or where smaller workstations are required. The EV series : Our diode-pumped, solid state lasers in IR (1064nm),and Green (532nm) wavelengths allow the marking and engraving of metals (to 0.020” with our EV40) as well as materials that can’t normally be marked by lasers such as plastics and composites. The superior beam quality and stability of the EV series make it the clear choice for applications requiring high quality graphics marking micro-machining and engraving on a wide range materials. These lasers are extremely dependable in high production manufacturing environments, with expected pump diode lifetimes that can exceed 200,000 hours. The CO2 : Our CO2 Laser Marking Systems provide precise, clear text, codes and graphics on coated metals and organic substrates. Quality components and high speed galvanometers on our proven, air-cooled design provide for superior marking and long system life. CO2 lasers are great for wood, glass and leather products as well as for the bleaching of anodized surfaces without harming the coatings. Anodized mounts, scopes, slides, receivers and frames are a perfect application for the CO30AP LASER. Standard products are available in a range of powers from 10W to 60W with a variety of marking field sizes. *Custom configurations, MOTF (Marking on the Fly), and CDRH Safety enclosures are available upon request. In addition to our laser marking systems, is our trusted world-famous, low stress PINSTAMP® marking systems. Low cost, durable, and available in a range of models, they are the choice in DPM applications. With text, logos, and 2-D codes marked to depths in excess of 0.020” in steel, programmable text heights and 2-D matrix capable, they offer a proven economical solution for your industry. With our floating pin technology, Telesis PINSTAMP® units are the better option for marking on uneven and rounded frame and barrel components; they are also available in a range of configurations for ease of use, operation, and integration, with electric or pneumatic options. Benchtop and Integrated: our TMP1700 and TMP6100 lead way in single pin, quality marking systems. *Available with additional configuration options including Theta, and Z-axis control. Hand Held / Mobile: The Telesis BM460 and TMP4210 make hand held applications simple and reliable, allowing you to mark large items easily, while the deep indent TMP4500E can handle the tough options, giving you a deep mark from a light weight, versatile electric pin marker. Engine components, vehicle frames, and large bore guns are perfect applications for these systems. *Carts, tool support, and custom stand-offs are all available upon request.